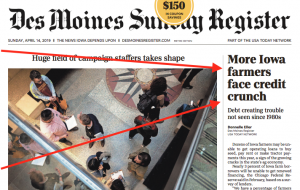 Donnelle Eller reported on the front page of Sunday’s Des Moines Register that, “Dozens of Iowa farmers may be unable to get operating loans to buy seed, pay rent or make tractor payments this year, a sign of the growing cracks in the state’s ag economy. 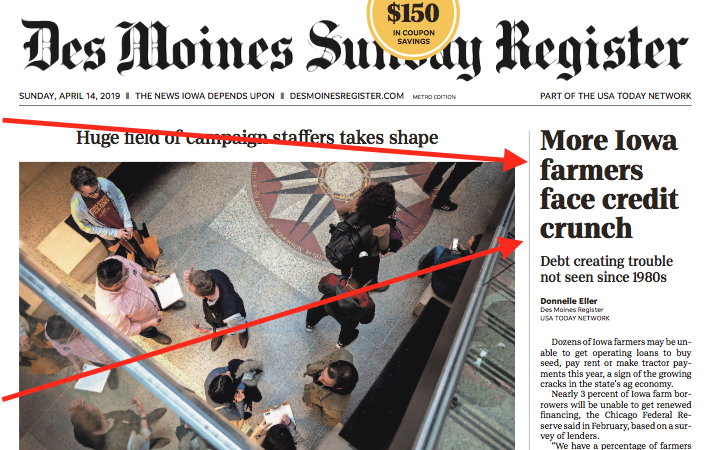 Front Page, The Des Moines Register (Sunday, April 14, 2019). 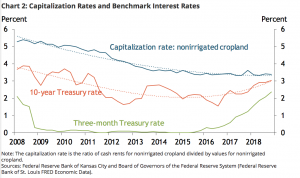 “Nearly 3 percent of Iowa farm borrowers will be unable to get renewed financing, the Chicago Federal Reserve said in February, based on a survey of lenders. 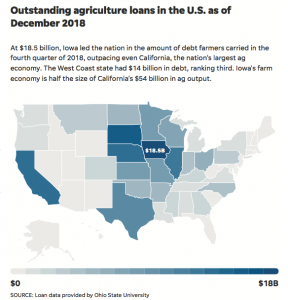 ‘We have a percentage of farmers who are at the end of their credit ropes,’ said Chad Hart, an Iowa State University agricultural economist. Iowa had the most agriculture debt of any other state in the nation last year at $18.5 billion, outpacing even California, the country’s largest farm economy, which ranked third with nearly $14 billion in debt. Nationally, debt is projected to reach the highest level since the 1980s farm crisis. Iowa loan delinquencies nearly quadrupled to $223 million over the past five years, the fourth-largest amount nationally. Despite the increase, Iowa’s delinquency rate remains a low 1.2%, ranking 41st in the nation. And earlier this month, Minneapolis Star Tribune writer Jim Spencer reported that, “America’s depressed agricultural economy is not yet at ‘a tipping point where vast numbers of farms will be lost,’ the CEO of one of the country’s biggest agricultural lenders says. But ‘there’s bleeding going on’ thanks to a confluence of low commodity prices, bad weather and tariffs. It’s forcing some farmers to refinance loans and convincing others to retire. The article stated that, “Many grain farmers have not generated income for four or five years owing to bad market and weather conditions, Hebrink said. They have been living off working capital. However, in a separate Star Tribune article recently, Adam Belz reported that, “Farmland values leveled off after 2014, but acreage is still selling at historically high prices in the Upper Midwest. And that’s a good thing for Minnesota farmers, who endured their least profitable year in three decades in 2018 thanks to low grain, meat and milk prices, a trade war with China and bad weather. “Despite all the headwinds in agriculture, average land values in Minnesota rose 4.5 percent in 2018, according to data compiled at the University of Minnesota. Anecdotally, land prices haven’t dropped this year. 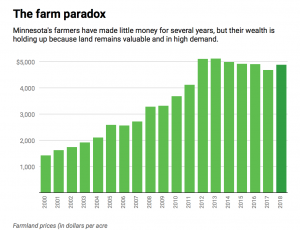 “Farmland prices reach historic highs in Upper Midwest,” by Adam Belz. The Minneapolis Start Tribune (March 30, 2019). “Zhang, at Iowa State, said growing farm financial stress is starting to force lenders to encourage farmers to sell land. As that happens more, supply may increase and prices may be affected. Another reason more land could come on the market is the age of farmers. In Iowa, for instance, more than 60 percent of land is owned by a farmer older than 65,” the article said. 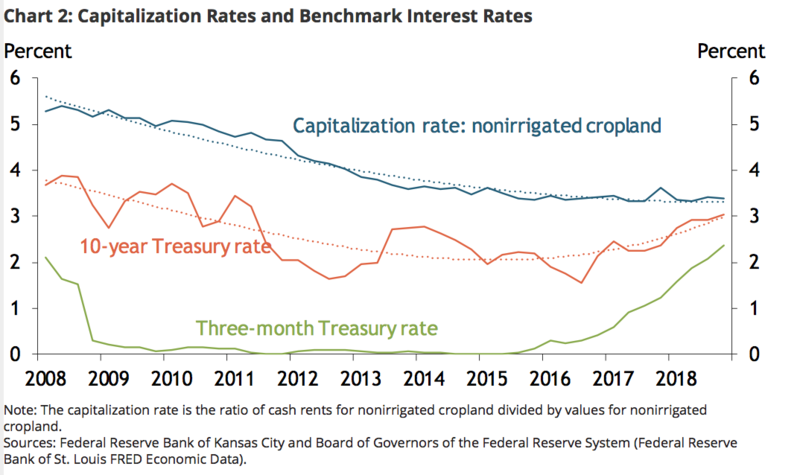 “The Outlook for Farmland Values amid Higher Interest Rates,” by Cortney Cowley and Nathan Kauffman. The Federal Reserve Bank of Kansas City (April 10, 2019). 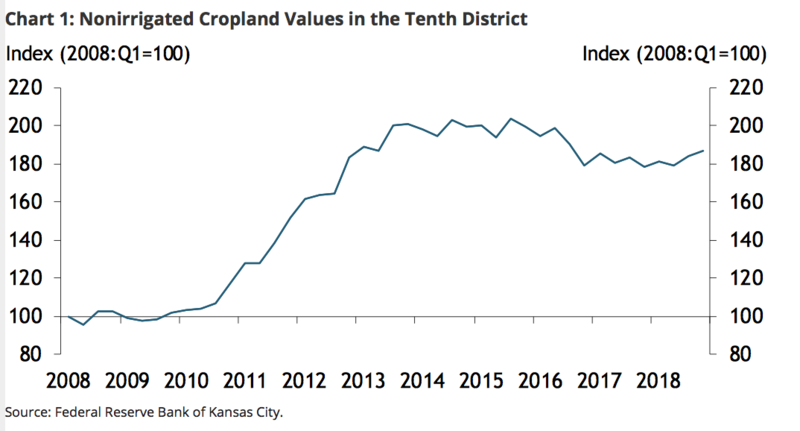 Although farm real estate markets have been relatively stable amid significant declines in commodity prices and farm income, risks of further declines in farmland values appear to have increased. 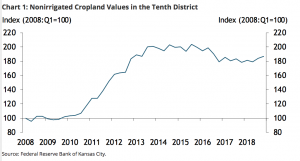 Cowley and Kauffman indicated that, “Together, the uptick in farmland sales in some states and the lower spread between returns to farmland and benchmark interest rates suggest farmland values could decline further. 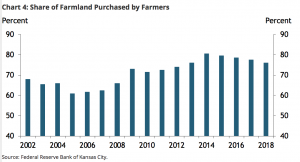 Thus far, farmland values have remained relatively stable, and demand for farmland has generally remained steady. For example, despite significant declines in farm income, farmers have generally remained active buyers in farm real estate markets. 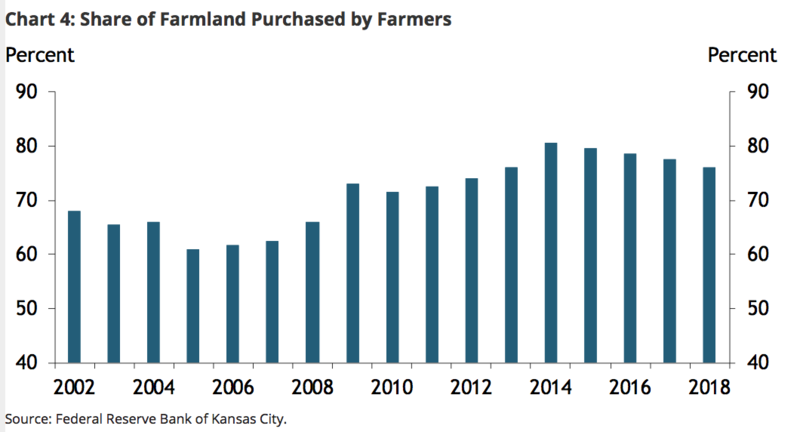 In fact, Chart 4 (below) shows that farmers accounted for more than 75 percent of farmland purchases in the Tenth District in 2018.